If you have a child who needs dermatological care, Dr. Martha Arroyo of Lakeside Dermatology in Libertyville and Gurnee, Illinois, offers expert pediatric care for patients under 18 years old. Dr. Arroyo works with children and their parents to provide the highest quality gentle skincare and dermatology treatments for families. What is pediatric dermatology care? Pediatric care involves the specialized care of young children and adolescents until they reach the age of 18. Pediatric care focuses on providing gentle, thoughtful care for young patients and their families in a welcoming environment. Many common skin conditions can strike at any age, but specific issues are more likely to arise at a young age and require pediatric dermatology expertise for the best outcomes. What conditions can be treated by a pediatric dermatologist? While children and adults can experience many of the same skin conditions, pediatric dermatologists can treat conditions that are more common in young patients with an awareness of their unique and growing needs. If your child is experiencing a skin issue or any of the following conditions, please schedule an appointment at Dr. Arroyo’s office. Acne is well-known for plaguing adolescents, but it can occur in younger children as well. Acne is treatable through numerous topical and prescription medications along with proper hygiene techniques. The team at Lakeside Dermatology is well-versed in helping families overcome childhood and teenage acne and will work with your family to create a comprehensive acne care plan. Children and young people can be more likely to suffer from a fungal or bacterial skin infection which is treatable with medication. Sometimes children suffer from cosmetic skin issues that impact their confidence, such as skin tags, warts, moles, or pigmentation. Dr. Arroyo and her team can address your concerns and create a treatment plan that is safe and effective for your child’s needs, helping restore healthy self-confidence. Proper hygiene and adequate sun protection are essential for long-term skin health. Dr. Arroyo works with young patients to educate them and instill good habits early in life, leading to healthy skin over many years. Where can I go for children’s dermatology in Illinois? 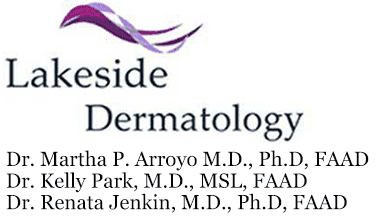 Dr. Martha Arroyo of Lakeside Dermatology offers a range of pediatric dermatology care services for children of all ages. From minor rashes to more significant surgeries, Dr. Arroyo provides personalized pediatric care for her young patients and their families. Lakeside Dermatology has two practice locations in Libertyville and Gurnee, Illinois, that offer pediatric care. To schedule an appointment to address your pediatric dermatology needs, call Lakeside Dermatology today.